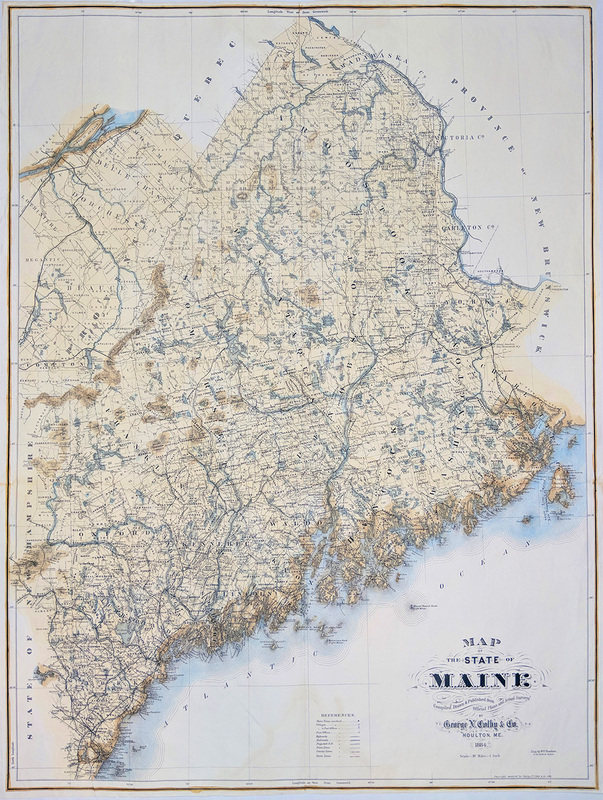 Maine Prints and Maps for sale. 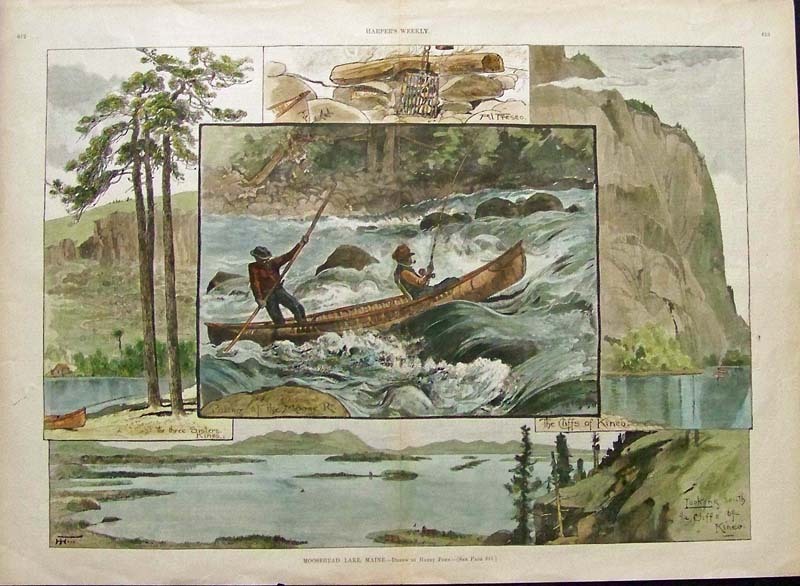 1880 Maine "Androscoggin River - Trotting Horses" Hand colored antique engraving. 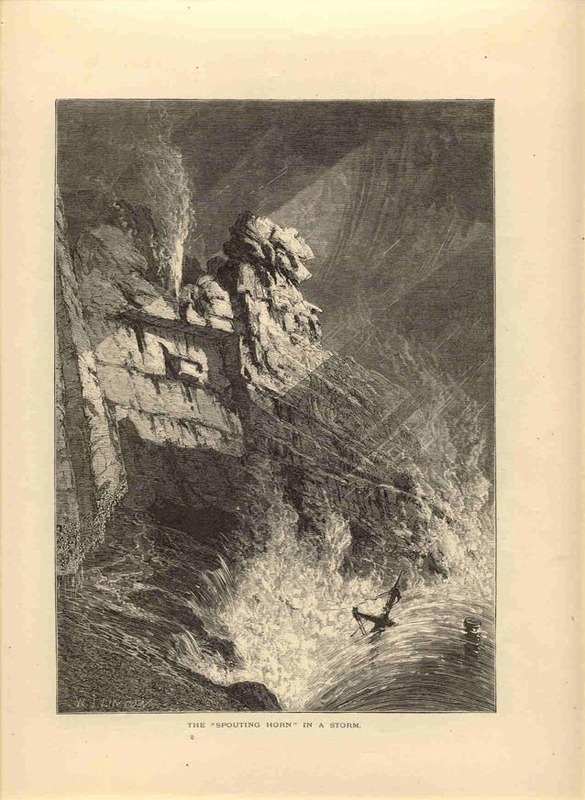 1873 "Spouting Horn" engraving. 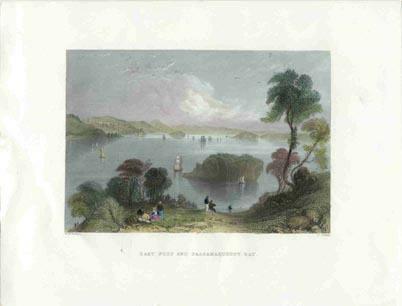 Hand colored antique print. 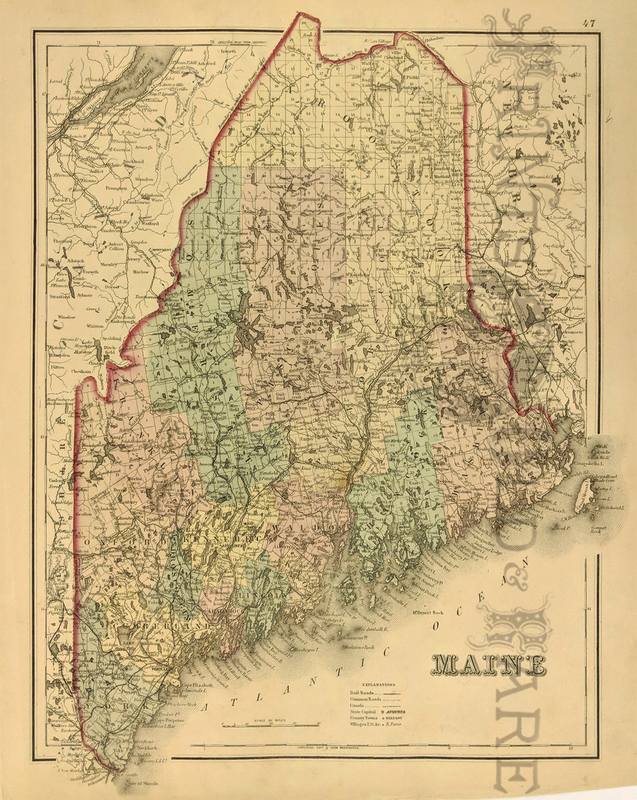 1863 Map - Maine, New Hampshire and Vermont. Hand colored. 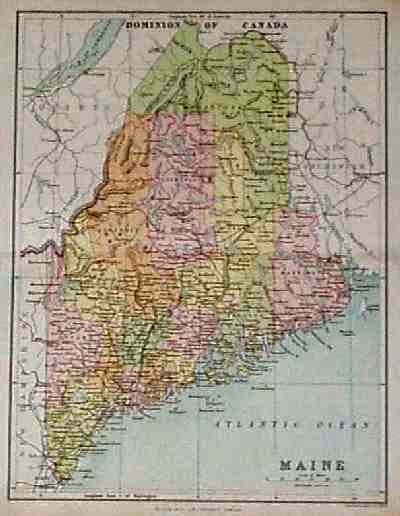 1901 Rand McNally color Map of Maine showing the Oulines of Counties, the chief cities, along with Key in red to the Maine Railroads. 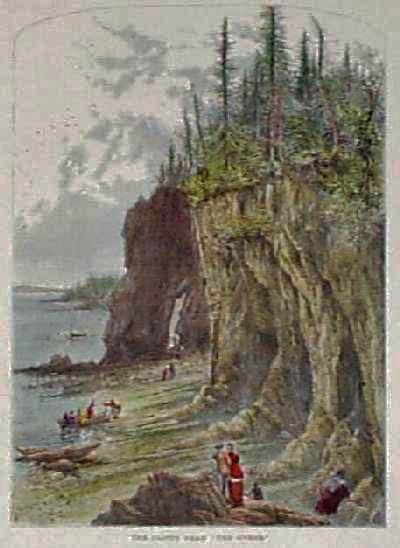 1873 View of the Cliffs near "The Ovens" on Mount Desert Island. 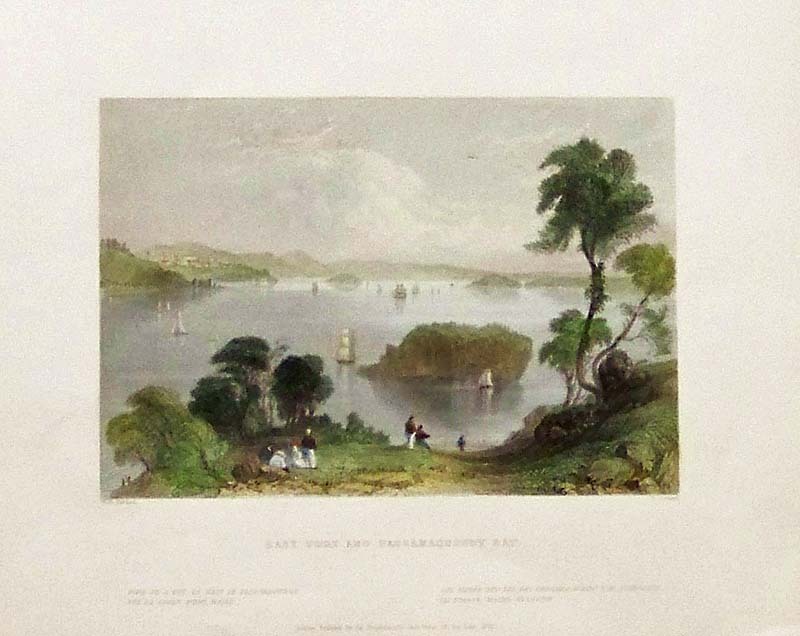 Nicely hand colored engraving from Picturesque America, with boats and sightseers in the foreground. 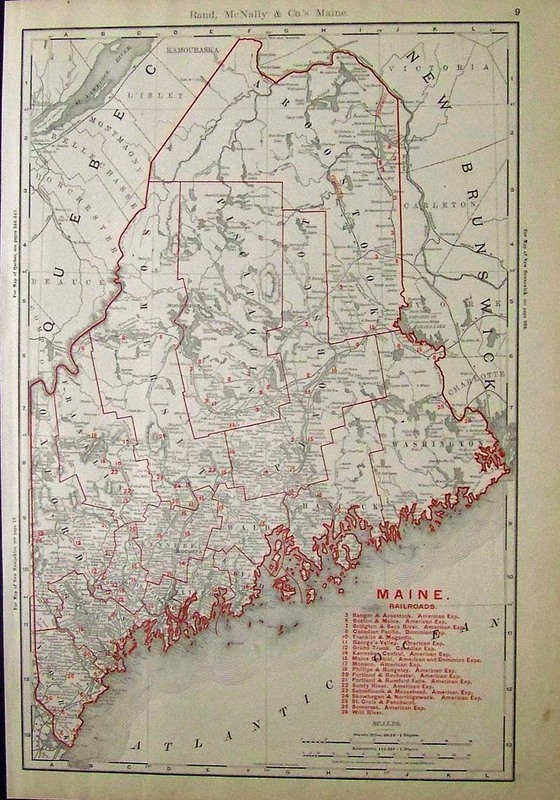 1897 Map of Maine, published by the J.B. Lippincott Company. 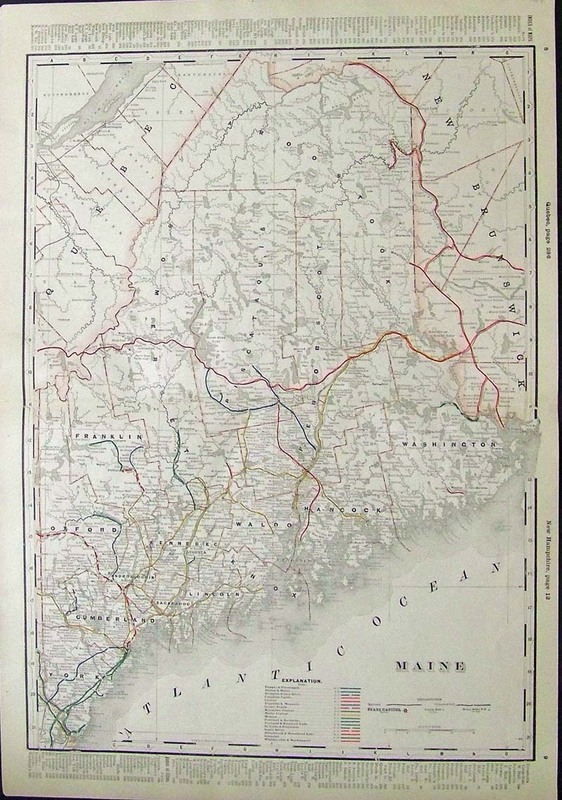 Color lithographed map, shows railroad lines throughout the state. 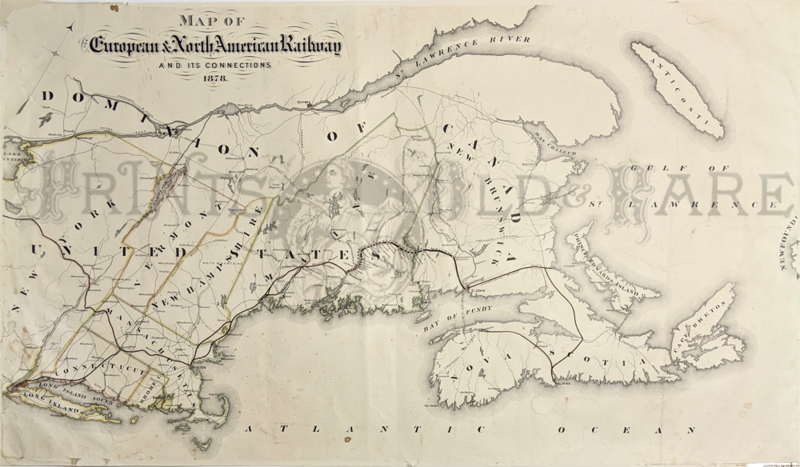 Map of the Railroads of New England O.W. Gray. 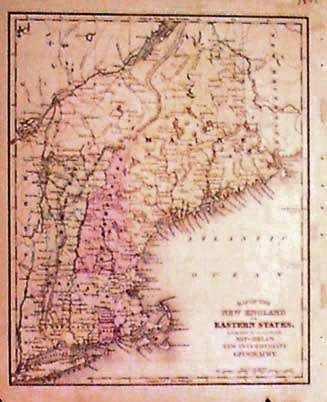 Large map of New England from New York to the Canadian border, detailing state and county boundaries and the extensive network of the railroads. 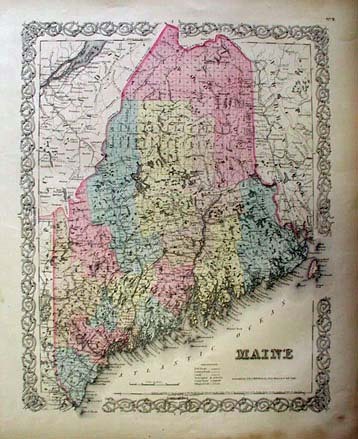 Inset map at lower right shows the 'Eastern Part of Maine.'. 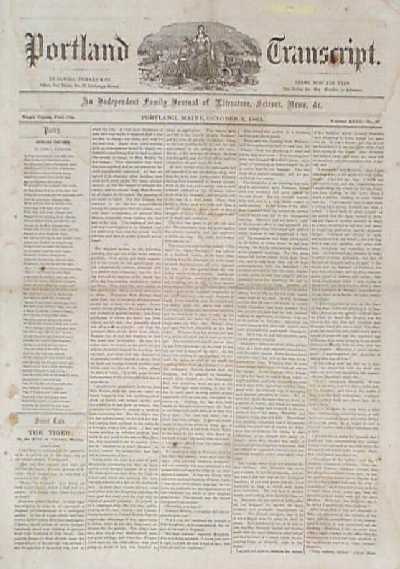 1863 issue of the Portland Transcript, "An Independent Family Journal of Literature, Science, News, Etc." Eight pages long. Contains short stories, poems, and news about current events in the Civil War. There are some light water stains and age spots on the pages, but overall condition is good. 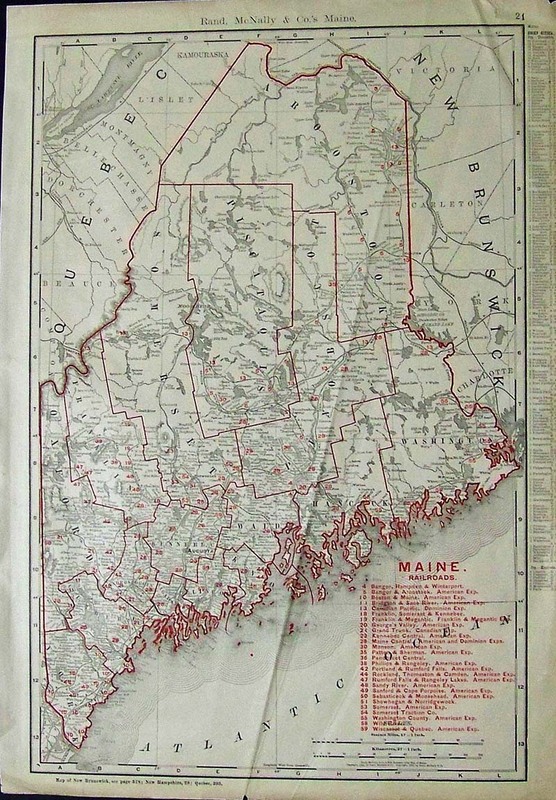 1889 Color lithographed map of Maine, showing the population, geographical features, cities and railroad lines. 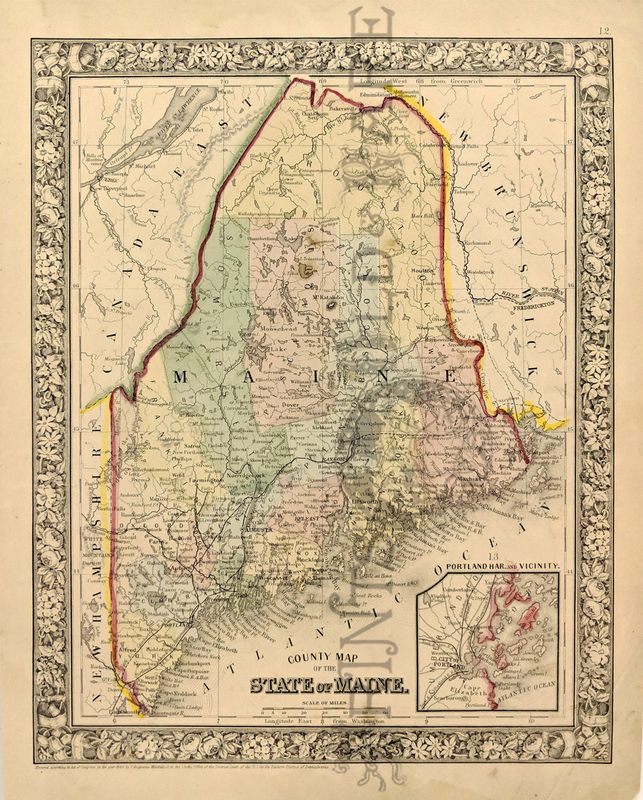 Beautiful map of Maine published in 1855 by J.H. Colton. 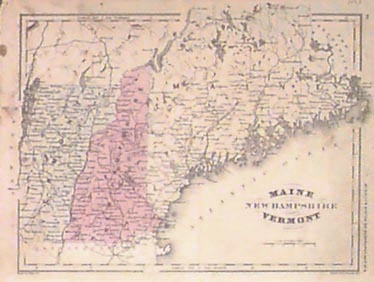 Original hand coloring shows individual counties. 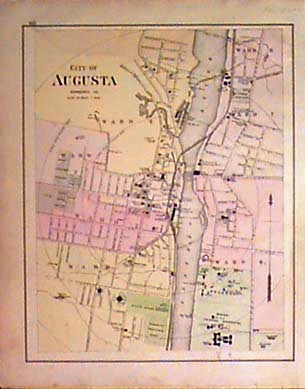 Map includes railroad lines, common roads, canals, and more. Decorative border surrounding map. 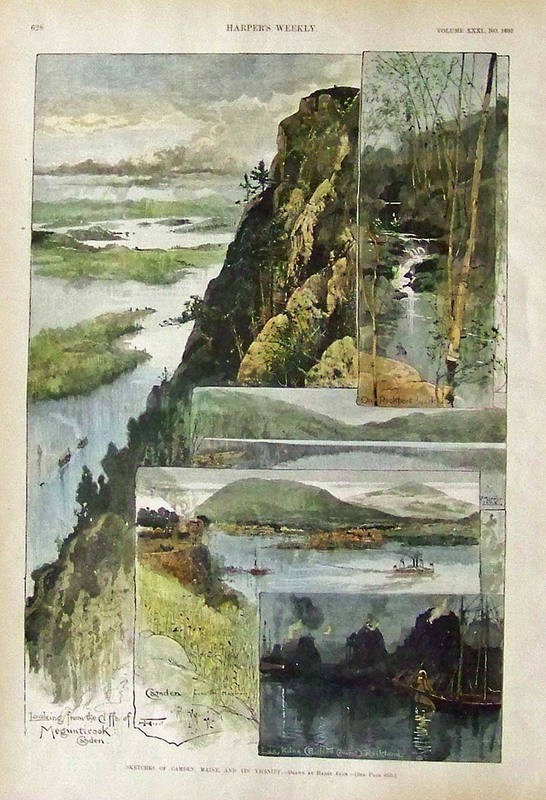 1888 Hand colored wood engraving titled, "On Top of Newport Mountain, Mount Desert." Drawn by C.S. Reinhart. 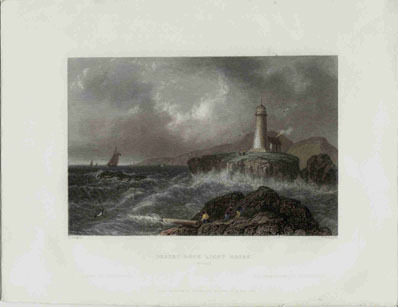 Image featured in Harper's Weekly. 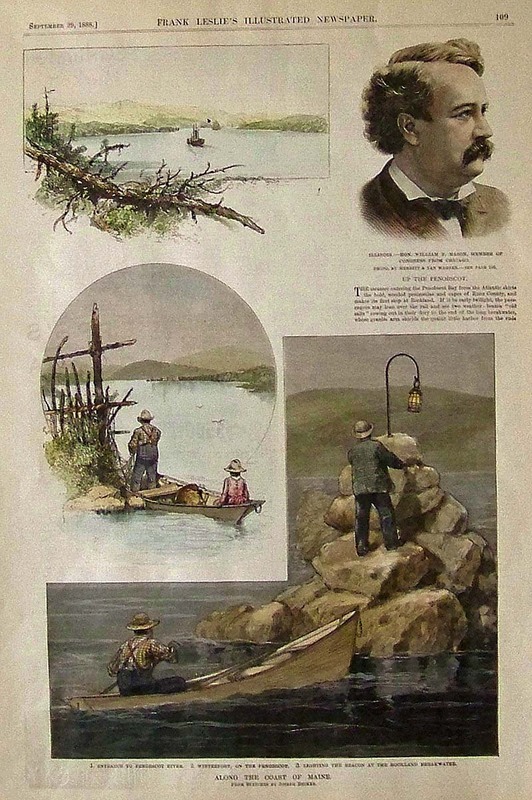 1888 Harper's Weekly hand colored wood engraving titled, "Moosehead Lake, Maine." Drawn by Harry Fenn. 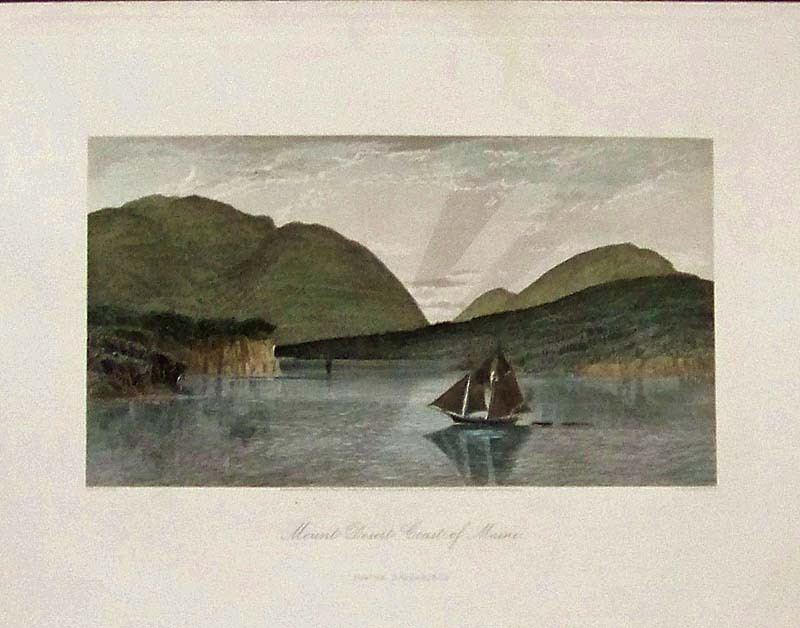 1873 Hand colored steel engraving titled, "Mount Desert, Coast of Maine." Published by D. Appleton & Co., NY. 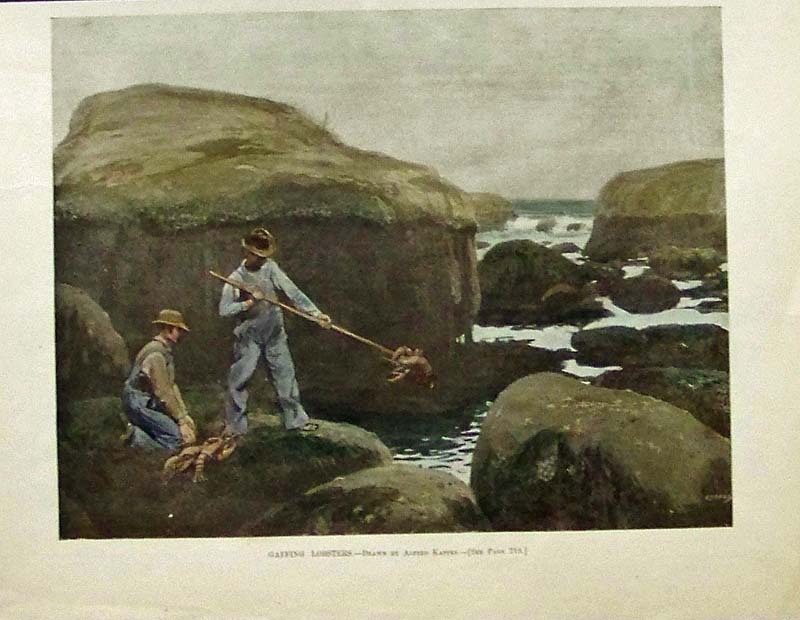 1895 Hand colored half-tone image titled, "Gaffing Lobsters." Drawn by Alfred Kappes. 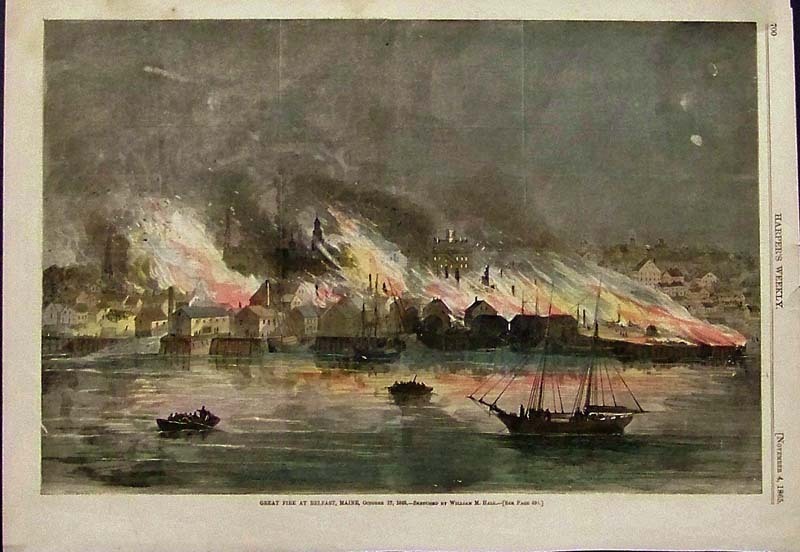 1865 Hand colored wood engraving from Harper's Weekly titled, "Great Fire at Belfast, Maine, October 17, 1865." 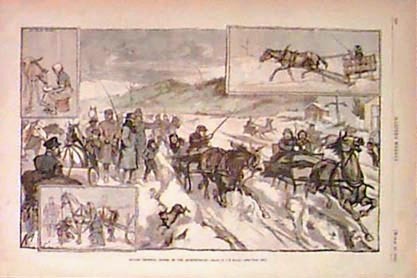 Sketched by William M. Hall. 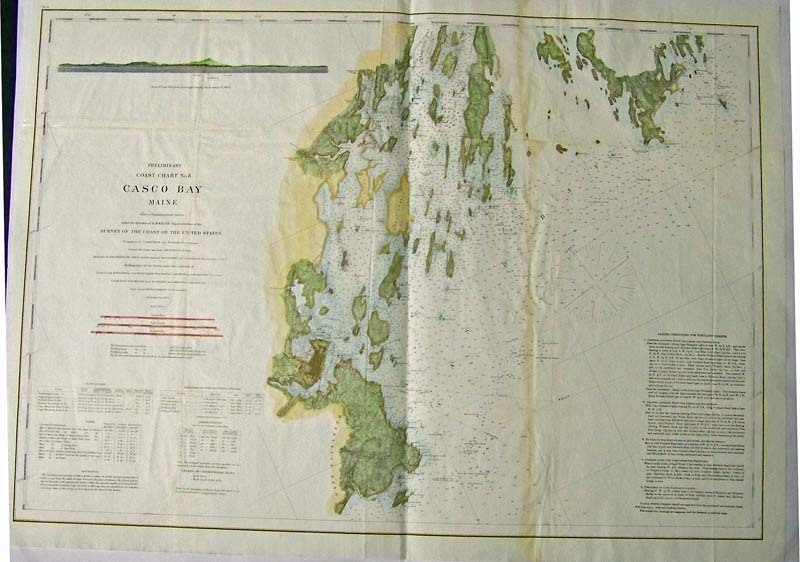 1854 Hand colored lithographed U.S. Coast Survey by A.D. Bache, Reconnaissance of the Eastern Part of Eggemoggin Reach, Maine with inset Sub-Sketch. 1898 Rand, McNally & Company's Main Railroads Map, outlined in red with railroads key bottom right. 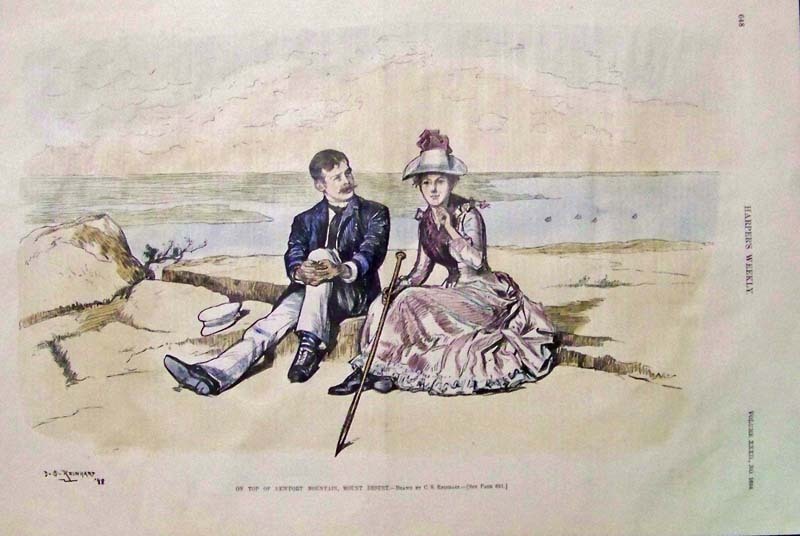 1888 Hand colored wood engraving titled, "Along The Coast of Maine." The first scene shows the entrance to Penobscot River; the second scene shows Winterfort, on the Penobscot; and the third scene shows a man lighting the Beacon at the Rockland Breakwater. Portland Birdseye View 1865. 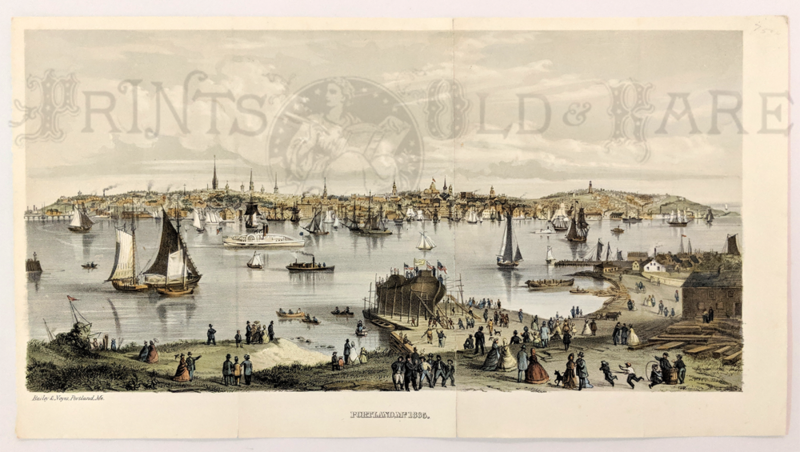 Beautiful steel engraved panorama showing river with ships and hills, ship building in the foreground. 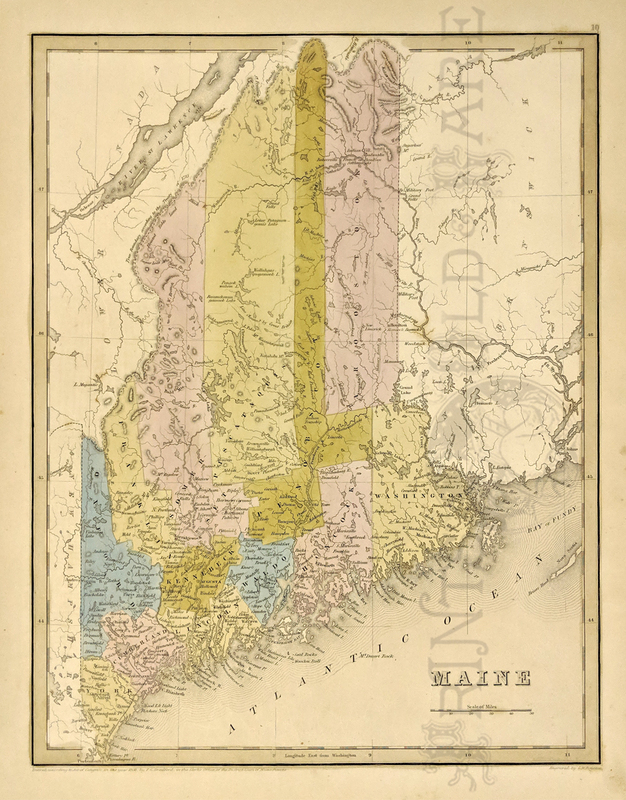 Map of Northern Maine: Specially adapted to the uses of lumbermen and sportsmen. 1899. 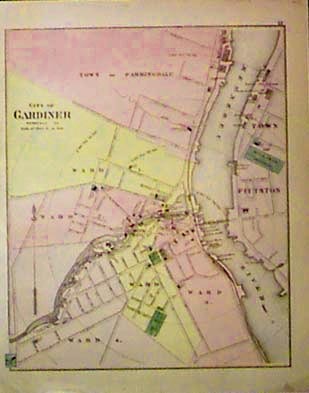 Shows winter roads, farms, taverns, carries, existing and proposed railroads. 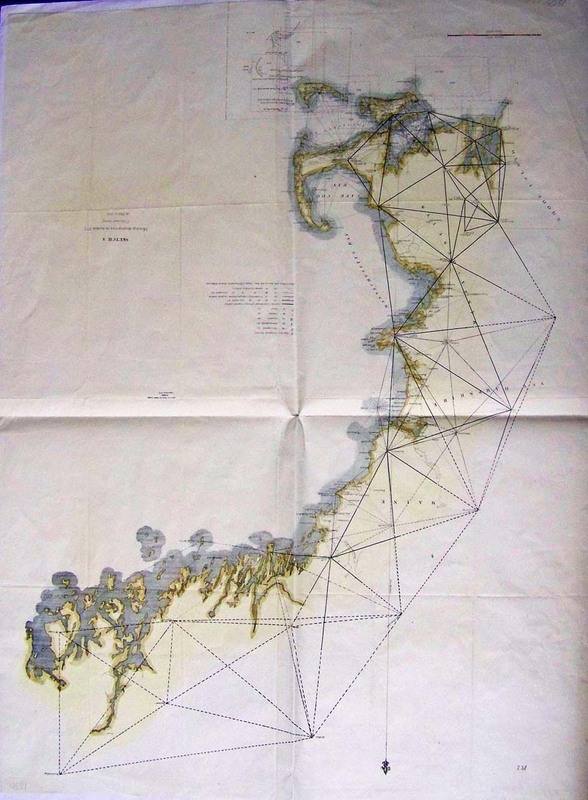 **Map has been archivally mended. Small writing in pen is also found in the front. 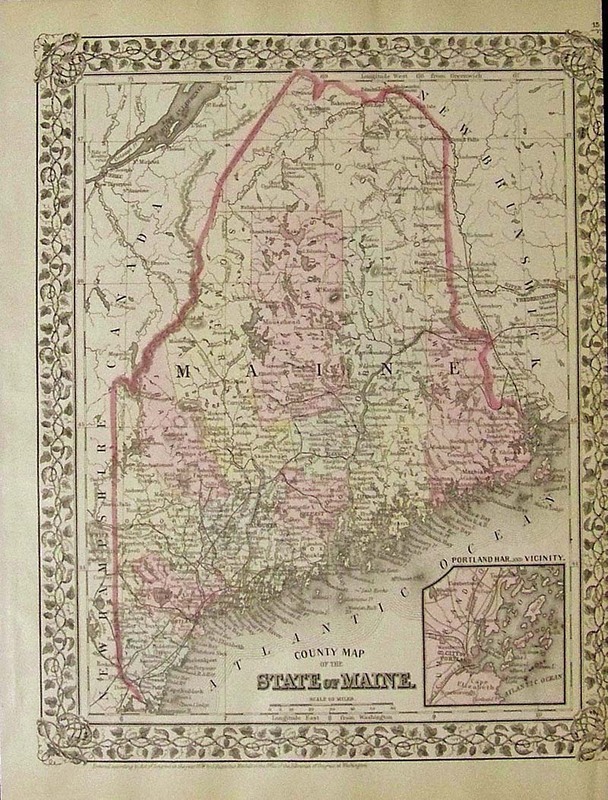 1841 Bradford map of Maine. Detailing the rivers, lakes, towns and counties. Political and topographical are also featured. Hand colored, lithograph. *Map was first issued in the 1838 edition of Bradford's Atlas but this one appeared in Samuel Goodrich's atlas from 1841. 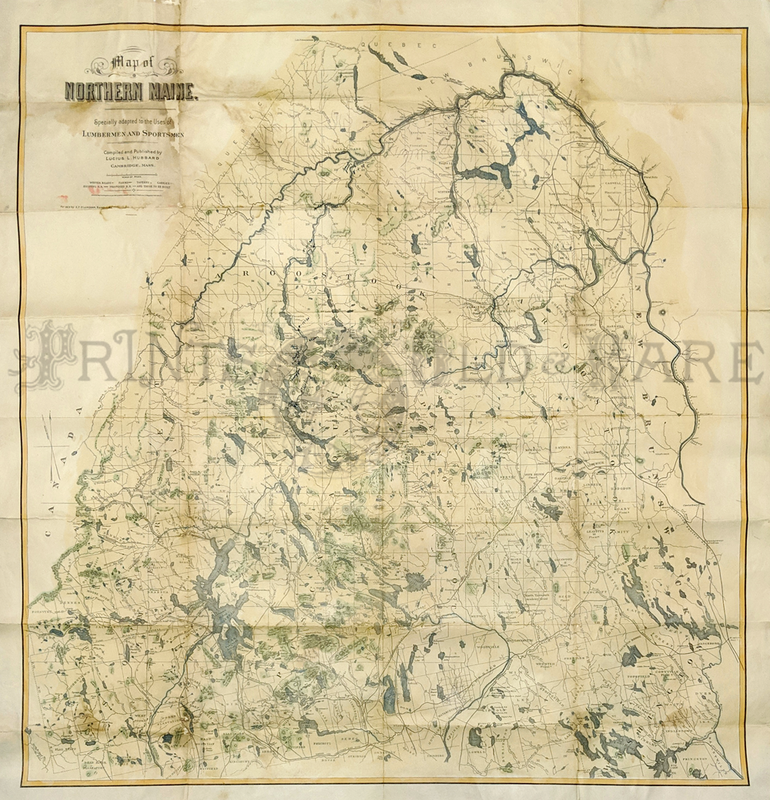 1872 U.S. Coast Survey Map of Damariscotta and Medomak Rivers, Maine. 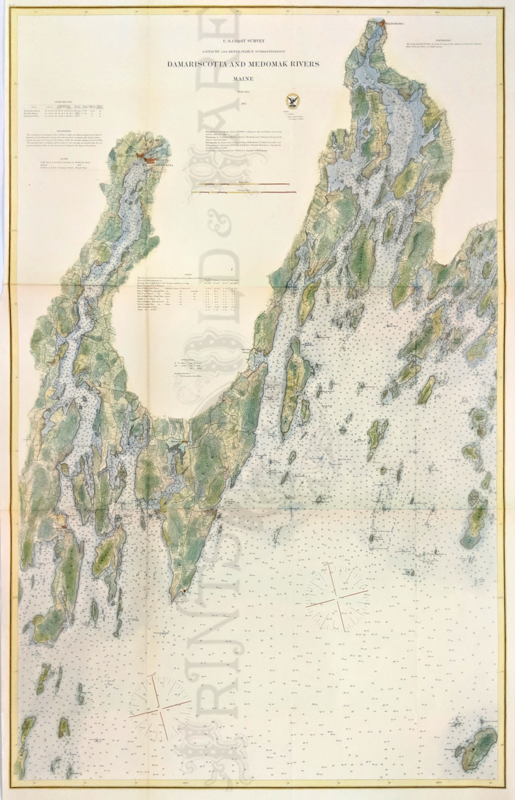 Beautifully hand colored lithograph showing light houses, soundings, buoy's, tides, topography and hydrography. 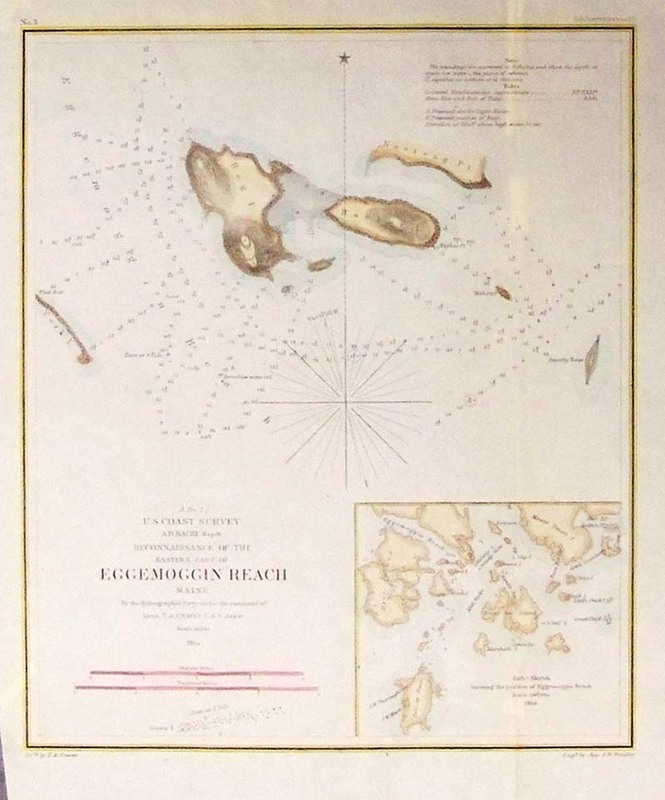 Includes Monhegan Island and Pemaquid Point. 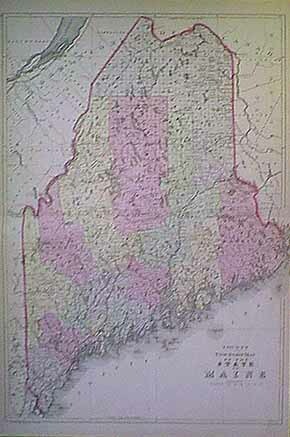 Gray’s Atlas Map of Maine. Shows Railroads, Common Roads, Canals, State Capital, Counties, Towns and Villages. 1875. 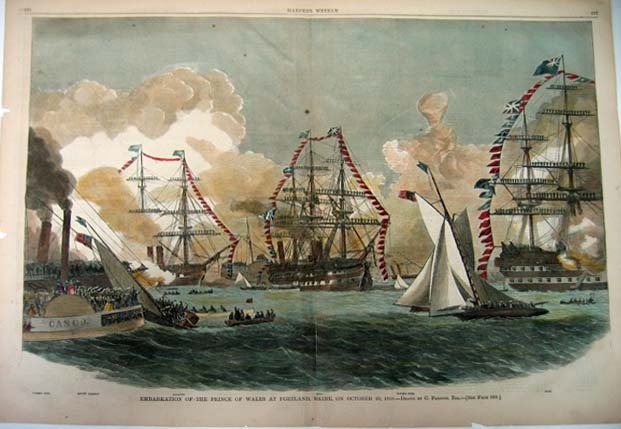 Hand colored, Lithograph. 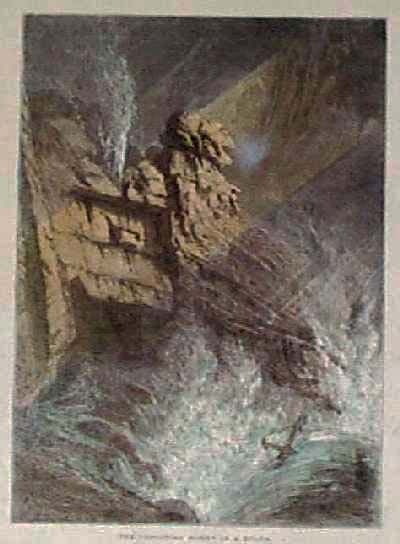 1855 J.H. 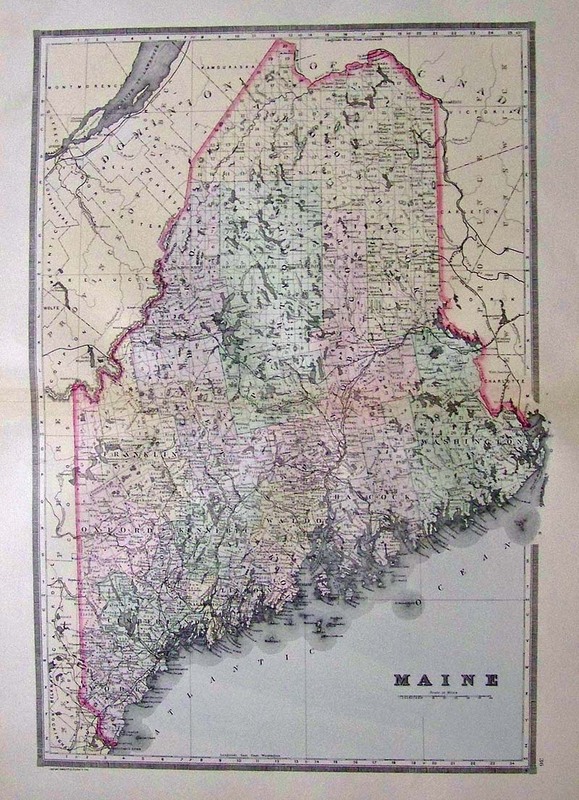 Colton original hand colored engraved map of Maine. 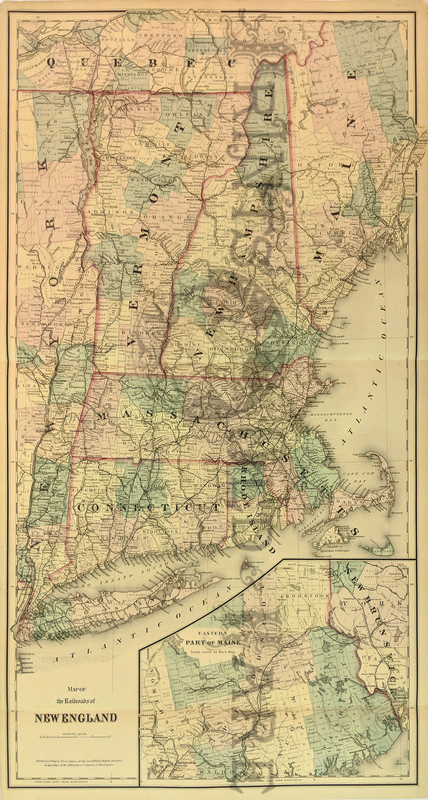 Colton was among the earliest map makers with very accurate maps depicting cities and states in the United States. 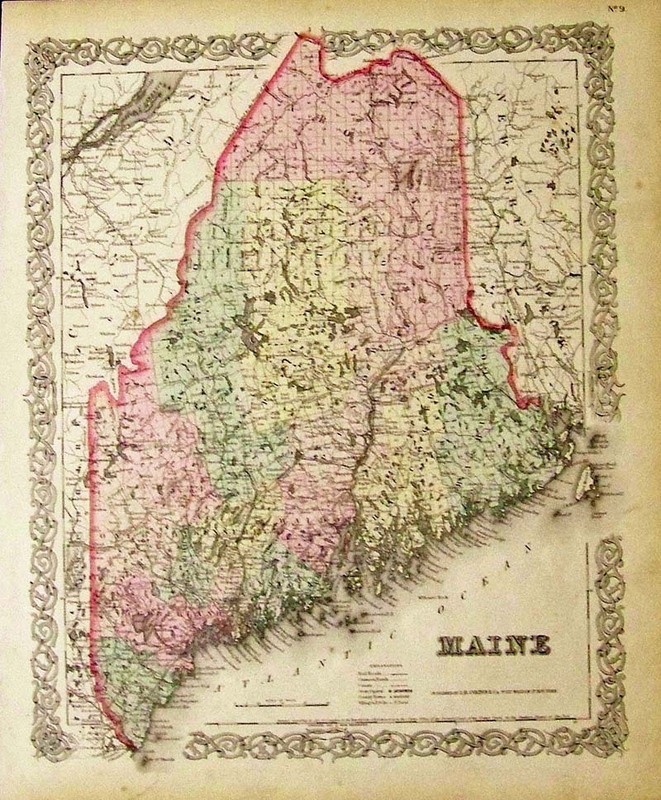 1879 Mitchell's original hand colored County Map of the State of Maine, with small inset of Portland Harbor and Vicinity. Entered According to Act of congress in the Office of the Librarian of Congress at Washington. 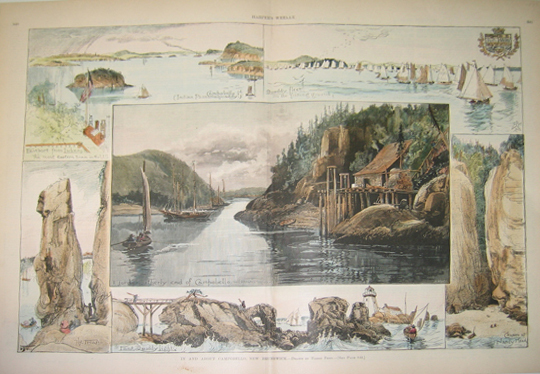 1888 Hand colored wood engraving showing Scenes In and About Castine, On Penobscot Bay. 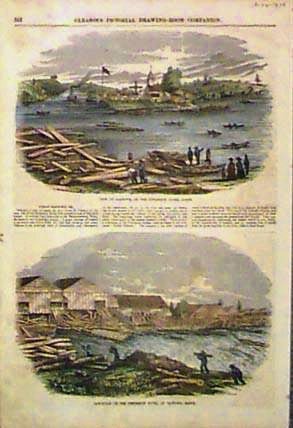 The bottom image is of interest as the land, Fort Madison was used in the War of 1812. 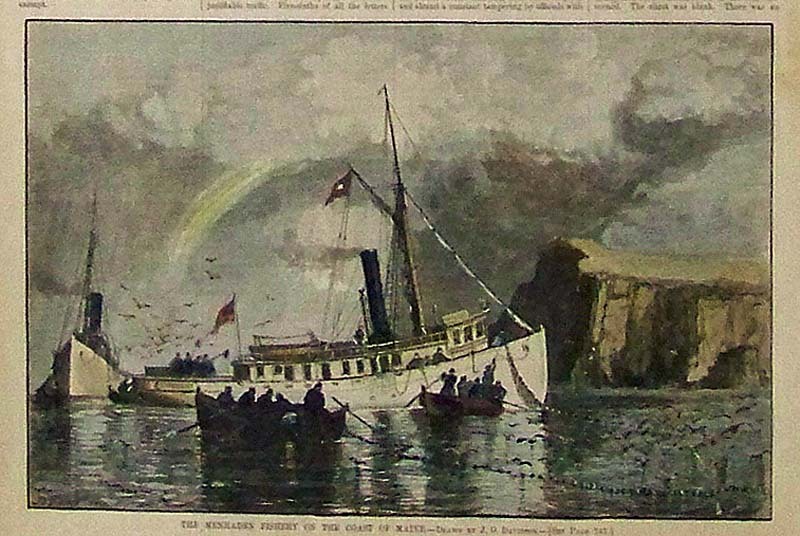 Featured in Frank Leslie's Illustrated Newspaper. 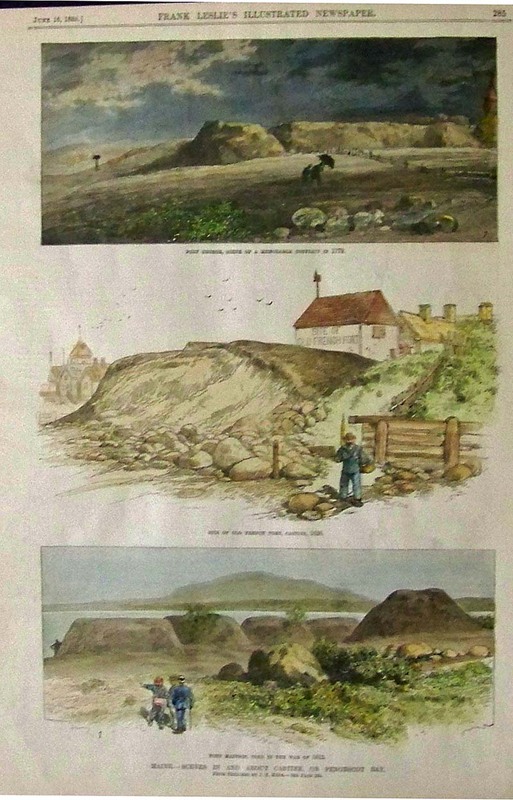 1887 Harper's Weekly hand colored wood engraving showing Sketches of Camden, Maine, and its Vicinity. Drawn by Harry Fenn. 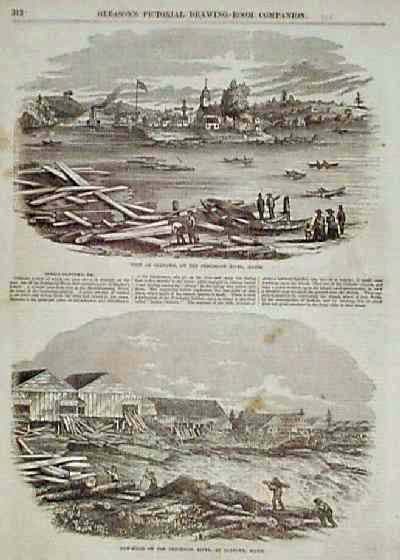 1879 Hand colored wood engraving showing a rainbow overlooking the Menhaden Fishery on the coast of Maine. Drawn by J.O. Davidson. 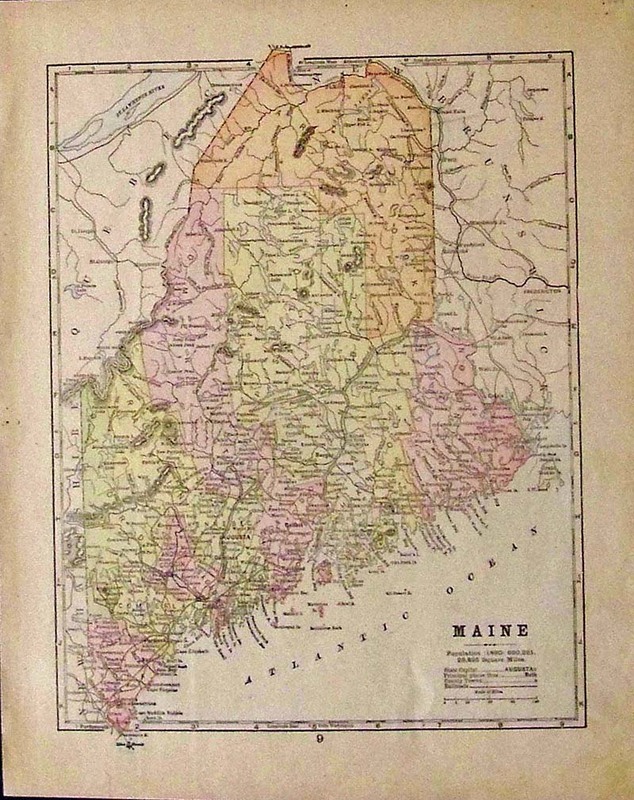 1892 Rare Color map of Maine with an Explanation guide showing the colors of various locations. 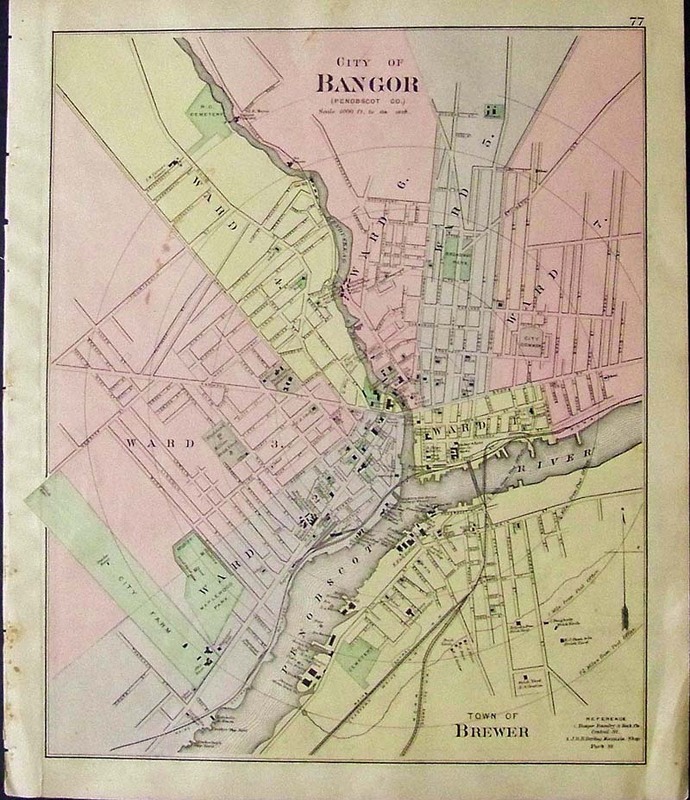 1905 Color map showing the City of Bangor. 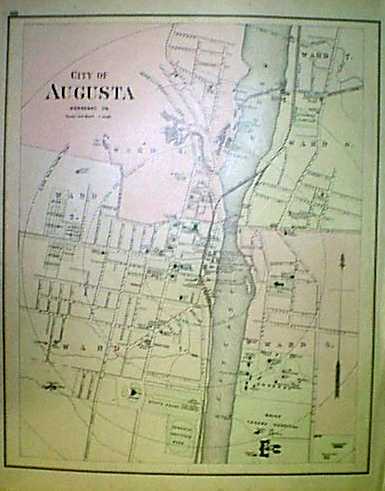 (Penobscot Co.) Bottom of map shows the Town of Brewer. 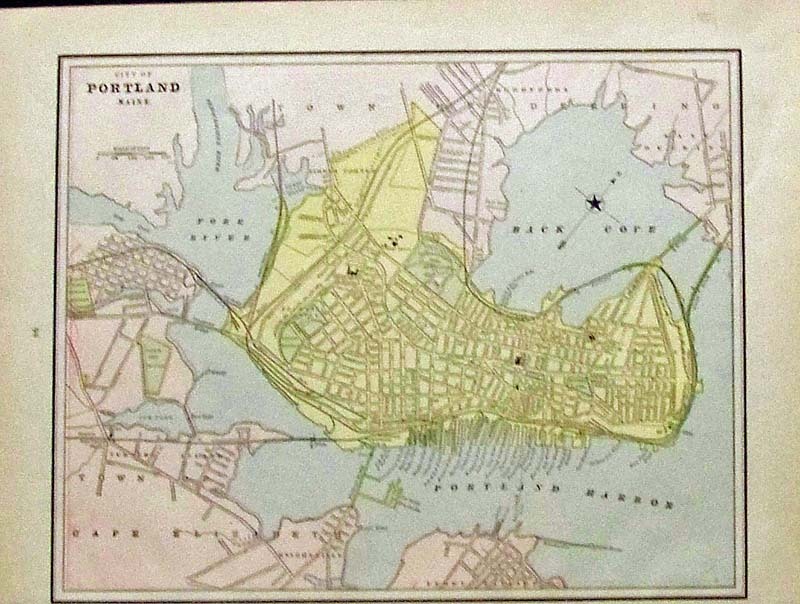 1889 Crams color City of Portland, Maine map. 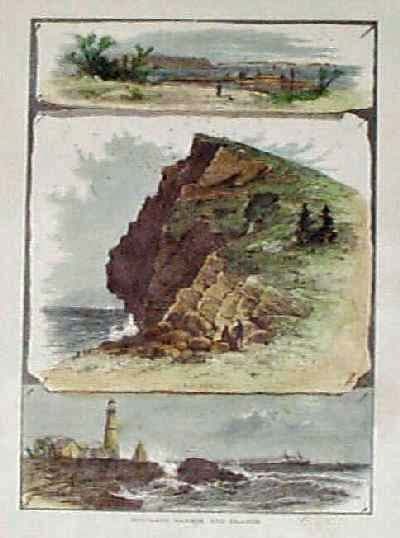 1850 Hand colored lithographed U.S. Coast Survey showing the progress in Sketch A. Cape Cod Bay and Massachusetts Bay are shown, alongwith New Hampshire and Rhode Island, among other locations. 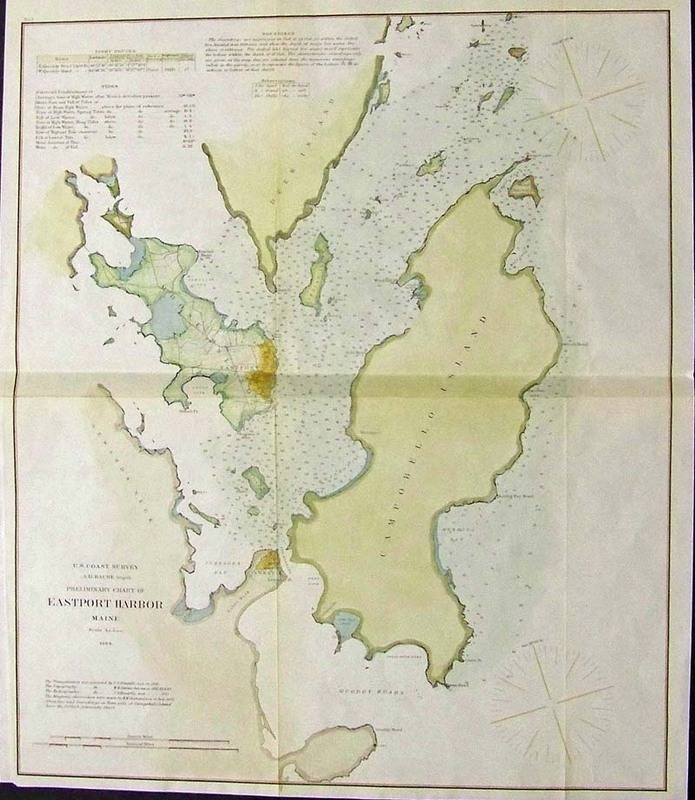 1864 Hand colored lithographed U.S. Coast Survey by A.D. Bache showing a Preliminary Chart of Eastport Harbor, Maine. 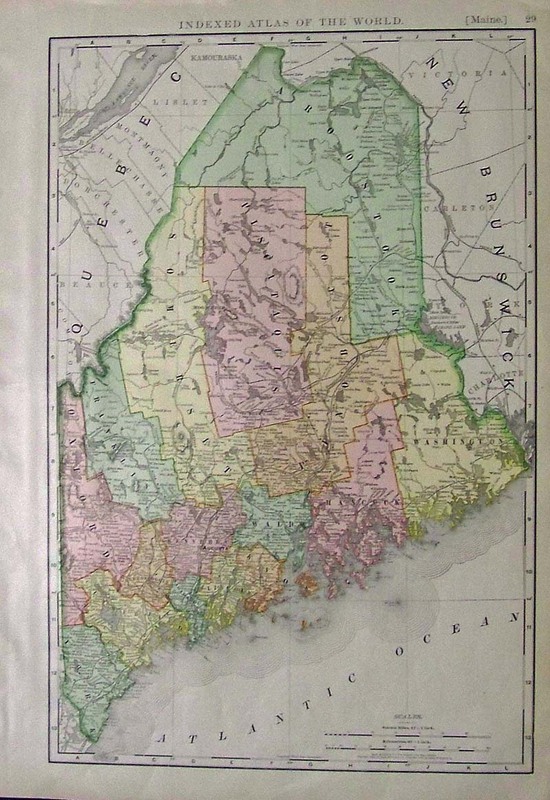 1891 Bradley's Atlas of the World's colored map of Maine.